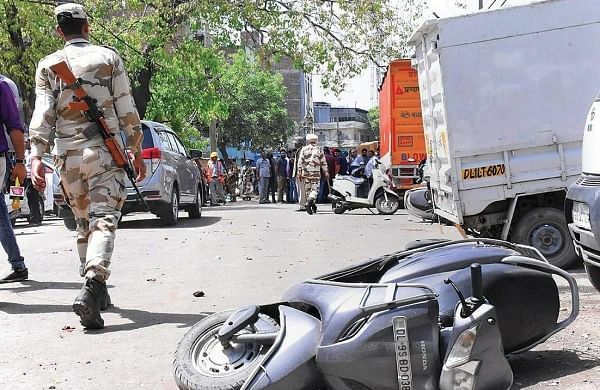 NEW DELHI: A day after the sealing drive in Mayapuri, the Aam Aadmi Party (AAP) on Sunday blamed the Bharatiya Janata Party (BJP) for the “barbaric” police action on traders in the area. “It is extremely shocking that instead of standing in solidarity with the traders of Mayapuri, the BJP first ordered Delhi Police to beat up poor traders brandishing sticks at them, and if this was not enough, paramilitary forces were called to further terrorise them by throwing bricks and stones on them. Is this the way to deal with traders? Who are they? They are residents of Delhi and our own people earning their livelihood. Are they terrorists? Why were they treated like this?” questioned Deputy Chief Minister Manish Sisodia. He was accompanied by environment Minister Imran Hussain. personnel and scrap dealers during the sealing drive. The drive was started by the Delhi Cantonment sub-divisional magistrate, the South Delhi Municipal Corporation and the Delhi Pollution Control Committee. Sisodia lashed out at Union Housing and Urban Affairs Minister Hardeep Singh Puri for blaming the AAP government for the violence, saying the responsibility of land allocation was with the Centre. “The BJP cannot fool anyone by shedding crocodile tears after it was exposed by videos showing its central government’s police unleashing barbarity on poor traders. The NGT had made DC North MCD as nodal officer for the Mayapuri issue. Who appointed him? Who appointed the SDM?” he added. The BJP, hitting back at the allegation, said, “After looking at the promises we have made in the BJP manifesto for traders, Kejriwal is looking for answers. So in order to malign the PM, his government gave the instructions. When the court had given time till May 3 to submit a report, then what was the need of action?” asked Delhi BJP President Manoj Tiwari.